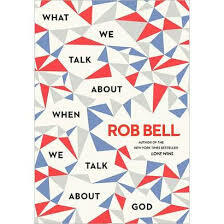 So my friends, Tweeter-verse, and church office have seen the arrival of Rob Bell’s new book “What We Talk About When We Talk About God” today. I think we are all mostly excited, if not a little apprehensive. I want to get something on the table and then ask a question. Rob had a huge pulpit in the spotlight and a massive swath of pod-rishoners. We heard his voice every week. He had a platform and he used it so well. We did not not know where he was theologically on so many things. Part of Love Wins’ electric charge was simply that so many of us liked what knew of Bell with his Nooma videos, tour events, and weekly podcasts – but there was just some stuff we didn’t know. The final ingredient for the storm was that he happen to come out of the theological shadows on a topic (hell-salvation) that is SO incredibly central to the very tribe that many assumed he was a part of. Evangelicals care about salvation. If he had written a book on any other topic, I doubt it would have caused even a minor stir. I think this because his previous book Jesus Wants To Save Christians was far more interesting and confrontational – but barely a cricket of controversy was heard. It was the merging of these 3 forces that provided the storm its energy. Bell was in the bright spot-light, he was a popular mystery, and he tackled a subject at the center of his tribe’s value set. None of those are present for the release of this book. He is no longer in the pulpit (or the pod). He is slightly less mysterious – especially after being in Newsweek, Time and the New Yorker. He is not shooting for a subject at the center. That last one is actually one of the reasons that I am excited about this book. He is addressing a more peripheral, abstract, elusive or ‘out there’ topic. It will be nice to be in conversation with him outside the inflamed intensity of Love Wins and his Mars Hill departure. I am nervous about something however. Admittedly, I might be the only one. I even asked Peter Rollins this question at our live show with Pete & Rob two weeks ago. What if the book is mis-titled? What if it turns out in the end that it should have called “What we think about when we think about God?” and is more of a conceptual address? What if Rob doesn’t talk about talking? I know that I might be the only one thinking this – but as someone who takes Ricoeur, Gadamer, Wittgenstein, Lindbeck – and in general the whole linguistic turn – seriously, I want to talk about the role that religious talk plays. I want to talk about how God-talk functions. Let me know. I’m interested. Just do me one favor: don’t be dismissive.